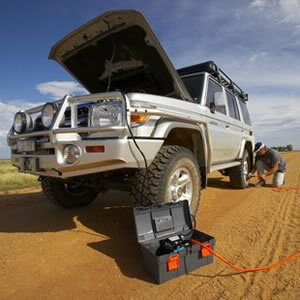 When you use a 4WD where it was intended you know that one of the most important accessories to have is an air compressor. Being able to manipulate the pressures of your tyres to suit the terrain can mean the difference between getting to your destination or not. Our ARB compressors come in a convenient plastic tackle box, with a 9-metre air hose and simple to install alligator clips to connect with the battery to power the compressor up. The provided dial type gauge is accurate.